Can I Eat This Wild Plant? When can I harvest so-and-so? Does it need any special treatment? Is there something I ought to watch out for? What plant will help with this insect bite? How often have you asked those question? And maybe even, what can I eat to survive if the chips are really down? Take the photo on the left (above on mobile devices). Can you eat that plant? No, unfortunately not. Well, at least not the plant you probably focused on. But you can eat at least two of the other plants, and you don't have to wait for one of them to fruit. 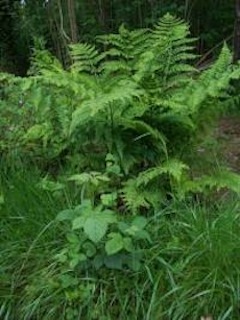 Ferns are generally not edible. Most contain carcinogens and an enzyme which destroys Vitamin B1. The edible plants in the photograph are Bramble (Blackberry) and grass. Yes, that's right, grass! But there are a few things to watch out for, so don't go running off to munch on your lawn. Actually, neither plant should or could be consumed as you see them. The bramble leaves need to be de-throned or used to make tea (the young buds can be eaten before the thorns develop). Oh, and did you know that bramble leaves taste like coconut? Just think how mighty strong cows and horses are, living much of the time on grass. However, grass, or rather the cellulose cell structure, cannot be digested by us humans, and thus we cannot get to the fabulous nutrients of the cell content. There is a way you can actually make use of all that goodness in grass. So, how can I find out which plants are edible? With a good foraging guide, and ideally, a field guide or botanical book to identify plants, unless you are thoroughly familiar with the plants you wish to know more about. You probably already know a number of wild plants, but have often wondered whether they could be eaten. Maybe you have a garden, and want to know if that "weed" has some use. Or you like the idea of foraging for wild food, but you want to do it safely. Maybe you are even worried about future food supplies for whatever reason, and want to feel secure in the knowledge that you could survive on wild stuff, if you really had to. I wanted a good foraging guide for all those reasons, and more, but could not find one which gave me the essential information, without having to dig around in loads of text. Actually, there was no one book with all the information I wanted between its covers. And what if I wanted to go on a walk in the country? This is what I'd have to take. 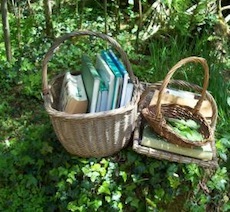 No, I couldn't go out foraging with a shelf load of books. There had to be another way. I already had a lot of experience in foraging for wild food, but there is a limit to how much data you can keep in your head, and I wanted the essential data at my finger tips. Ah, if you can't find what you want in the shops, you have to make it yourself. So I spent the next few years researching and gathering information, condensing it, taking pictures of plants, and putting it all together into one handy fact file. You see, I wrote that guide for myself. I wanted to be safe, I wanted to make use of that weed, and I also wanted to add some highly beneficial foods to my diet, and, and, and. Now it only takes a second or two to look up the information, and the guide is small enough to pop into my pocket or basket. And now you too can benefit without having to do the work. I know that frustration of not being able to find the answers in a reasonable time and space, so I know where you are coming from. Image page of the Rose profile. The Mobile Foraging Companion is a feature-laden guide which contains a list of over 300 edible plants in a handy format, as well as detailed profiles on about 50 common edible plants (most are illustrated) of temperate North America, and Britain and Northern Europe (there is a guide for both areas, to suit your needs). Whether you forage on a leisurely weekend walk, want to know about that weed in the garden, or want to prepare for a potential survival situation, this guide is one of the handiest reference guide on foraging. It is designed for quick access to all the essential information you want at your fingertips, no more wading through long text to find the facts you are looking for. For more information and to purchase the guide click here.